Last year, Yogi's collaboration with superstar rapper Pusha T, titled “Burial” took the EDM community by storm. 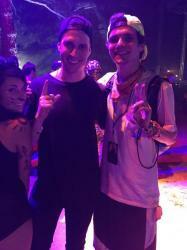 Notably, the track inspired OWSLA owner Skrillex to remix the song along with Trollphace, while OWLSA's other trap star Moody Good took it on on his own. As history goes, those two remixes took the song to unfathomable heights, and now all FOUR producers have come together to create one insane version, accompanied with an equally insane and semi-creepy music video. Words can't really describe the video, except Pusha T, and the cast of The Purge popping, locking, and dropping. Check it out below!